Hitwise reports that YouTube traffic is way up since its acquisition by Google. YouTube now gets 50% more traffic than all other video sites combined. 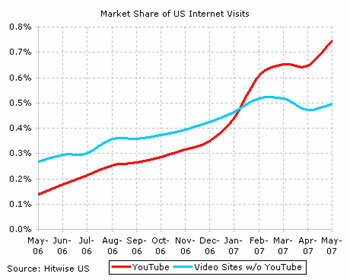 Hitwise traffic data shows that the market share of US visits to YouTube has increased by 70% when comparing January 2007 to May 2007 (this only includes site visits, not streams or streams from views on embedded videos). In comparison, the market share of visits to a custom category of 64 other video sites increased by only 8% in that period. Is Google Search Traffic Favoring YouTube? Hitwise also reports a 300% increase in the amount of traffic leaving search engines and going to video sites in the past year. In fact, a graph of YouTube’s share of visits over time suggests that its integration with Google has resulted in a big jump in visits, while hurting other video sites. YouTube traffic spikes around January of this year – around the time that Google announced its plans for YouTube. 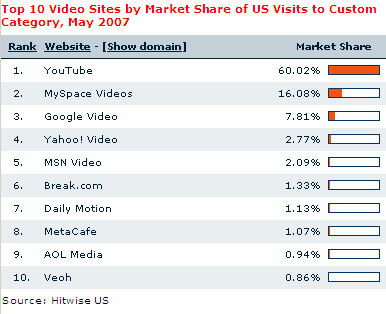 The market share of other video sites began to decline at the same time.